Remember the “Subtle Safety Ring” by RedStart? It’s the ring that folds out into a brass knuckle-like formation. I saw it awhile back and wanted it so badly but never got around to actually buying it. Well now the ladies at the San Francisco-based jewelry design company have a new version of the ring that’s part silver, part red acrylic, and I have to say I’m a little tempted to get it even though it doesn’t appear to fold out. (I can’t seem to find the all silver version anymore and I wonder if it’s because of laws about brass knuckles..?) This ring ranks very high up there on my list of jewelry that has a dangerous side. They also have a sweet collection of jewelry called the Bone Series whose pieces “call attention to the body, its curves and bones.” I love the bracelet! Fashionline’s covered the Paris shows, and Jean Paul Gaultier’s line caught my eye in particular. Well his hat hair more than anything. Yes, terrible pun, but how can anyone resist… top hats are one thing, crazy hair is another - but this takes it to a creative level even the mad hatter in alice in wonderland doesn’t seem capable of pulling off. I’m not sure if i’m impressed or horrified, but there’s something rather mesmerizing about that hair (and i can’t help but wonder if there’s a real hat in there somewhere)… and that Christine Suppes managed to avoid mentioning it in the write up. SONY ERICSSON K790! (you know you want it. Seriously, who doesn’t want a 3 megapixel camera/video phone that is that gorgeous AND is also an mp3 player, radio, and a world phone?) ~ so thus begins week 3 of our giveaway survey holidayfest… and this week (as you can see in the tags) is sponsored by Radar! So if you want a chance at these goodies and have NOT filled out our fun little survey yet, get to it! But, if you have ~ well you’re already entered… so just go play with Radar, so you’re ready to make best use of the phone if you win. That being said - you remember Radar right? (See here if not). Their service gives you a great way to have visual conversations with all of your friends ~ a way to share the fun moments and inside jokes you don’t necessarily want to broadcast around the world… as you can see from the images in the tags, its about living your life, and being able to share and comment on your images as well as your friends’. Browsable on your phone, computer, etc ~ you can keep in touch wherever you are, and have higher quality videos and images if you win this Sony Ericsson K790. Last night was gallery hopping night, and landed at ThinkSpace in SilverLake for most of the night hanging out with Olga Nunes + Sarah Coleman (of FABULIST fame! You know you read it, its too fab not to) ~ for Oddica’s big two day show “Cotton to Canvas” ~ brilliant concept, see if you can follow this logic - Oddica has artists create limited edition shirts, then gives the shirts to OTHER oddica artists to design traditional pieces inspired by the shirts - and who knows maybe some of these new pieces will make it full circle and become shirts too! MANY pictures of my favorites below~ and some randoms to give you a feel for the ambiance. 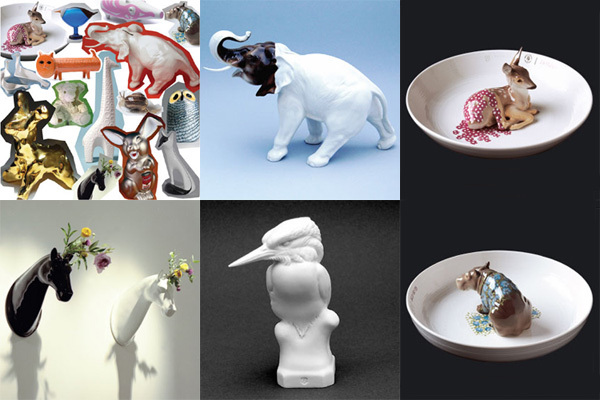 Inspired by owlsgo’s post on .org ~ Vessel’s latest exhibition “Animal Magic” brings together some of the finest designers and materials in a unique collection of animal figurines from the traditional to abstract… above are some horse vases from Jaimie Hayon, elephant from Maxim Velcovsky - Qubus, kingfisher from Porzellan Manufaktur Nymphenburg, and deer and hippo from Hella Jongerius. In the collection are also pieces from Jonathan Adler, Marcel Wanders, and others. Veering slightly from our regularly scheduled content - WTF? I am appalled, outraged, and amazed. My order of Tord Boontje bowls and dessert plates from target (yes i placed that order like a month ago)… not only aren’t here yet… well not the plates… but the bowls just woke me up this morning, and can you BELIEVE the SIZE of that box, or the amount of cardboard and paper i was sent? The bowls are like cereal bowls to give you some perspective. That big box is almost the size of the Think chair box. So as designer friendly as they may be, minimizing waste doesn’t seem to be so high on the list. I needed to vent, since Target made me feel dirty after all my eco happy posts last night. (Sydney, Australia). People Like Us Collective. Every web bubble need its chair. It’s a new bubble and web 2.0 is more eco conscious ~ and the chair to have is now the Steelcase Think! (it’s 99% recyclable) Round one had the Aeron Chair (and proof that their time has passed is the number of them you can find on SFC Craigslist being liquidated at any given time). My favorite aspects of this chair (other than that i love the way it looks in person even MORE than in a picture, so go find a showroom and go poke, prod, and bounce on it) ~ are the seat and back “flexors” (the silver rods you see in the center skeleton pic up there) they make it ridiculously comfortable since they give to your every move, and not too much or too little, but just enough. AND i’m the kind of 5’4” girl who likes to sit cross legged every now and then, and with the shape of the seat i can do so without feeling like i’m possibly going to flip over (not all super ergo chairs handle this well). See below for images of the unboxing, more pictures, and more about this designer masterpiece. FREE WIFI PHONE! Did that get your attention? Just incase you haven’t filled out the survey, or told your other friends to do it yet, thought it was about time to give you another reason to! This week we will be picking a winner for Untangled Life’s generous giveaway of the Netgear Wifi Skype phone.